Three-quarter length portrait of a girl, perhaps the hon. Anne, eldest daughter of Sir Jacob de Bouverie, 1st Viscount Folkestone. Provenance: ............by descent to David Pleydell-Bouverie (1911-2006), grandson of William, 5th Earl of Radnor. Bartholomew Dandridge was baptised in London on December 17th 1691. His initial training was at the St Martin’s Lane Academy and with Sir Godfrey Kneller, whose studio and practice he took over in 1731 after the latter’s death. Although he was trained in the relatively dull style of the school of Kneller, he was amongst the first in England to respond to the innovations of the rococo which were being imported into England from France in the early and mid 1730’s. These have a liveliness of composition and lightness and freshness of palette which divides them absolutely from the style of the 1720’s. 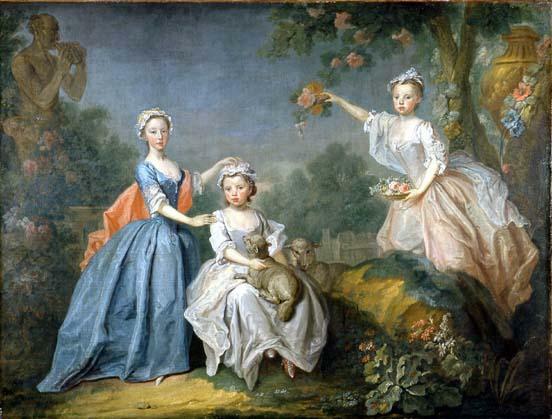 This painting, which is signed and dates from very close to 1735, is a very early essay in this new English Rococo style, and shows the rapid development which the artist brought about in these years: the following year (1736-7) he painted the daughters of the Earl of Gainsborough in what by then was a fully developed Frenchified style which looks more towards Watteau than it does towards Kneller. This picture, which is, as it were, on the cusp, still has faint echoes of the earlier style, especially in the rather dry manner in which the paint is handled, reminiscent of the late style of Kneller himself. There is an informality in the composition with the pet dog and garland of flowers, but the accessories like the urn are still classical. 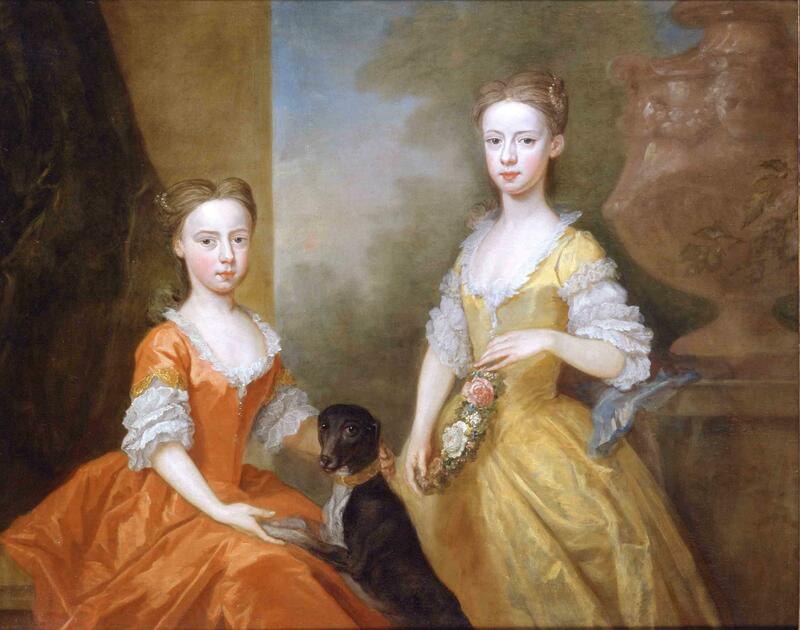 The Manchester painting illustrates the considerable progress made by Dandridge in the the years between 1735 and 1740: this is now in a full-blown rococo style which finds its roots deeply in French painting of the period. The composition is wholly assured, and the dry attenuated handing of the paint has been replaced with an altogether more fluid technique which looks towards such contemporary English painters as Highmore and Hudson. Here the classical urn is enlivened and soften with a garland of flowers, and the composition is altogether more mouvemente. In the present picture, Dandridge's favoured rococo motifs are repeated: the statue of the Armorino with a dolphin serves the same compositional purpose as the Satyr playing his pipe in the Manchester picture, whilst the sitter holds a chaplet of flowers just as in the Bridgwater painting of 1735. The pose of the sitter, caught fleetingly in movement, though, suggests a later date than this, around the early years of the 1740's, a dating which is supported by the fashionable dress of the sitter. The pose is, indeed, very “advanced” for English painting of this period, when most female portraits were still in the heavier Augustan style of Thomas Hudson and the like. In this, it looks forward to the style of painting developed by Joseph Wright of Derby in the early 1750's. 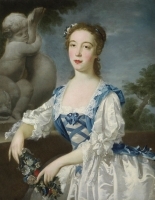 The identity of the sitter has been lost; however the descent within the family of the Lords Folkestone and Radnor, suggest that the sitter is of that family. She is of the right apparent age to be Anne, the eldest daughter of the 1st Lord Folkestone, who had married the heiress Mary Clarke in 1723.